The Avanti is back, sleek and original as ever. Tamer and costlier, it still struts like the thoroughbred it was born to be. It returns as the Avanti II with a facelift and a Chevrolet engine. Nate Altman bought tooling and some of the Studebaker buildings. The company has announced production plans and details of the new version of the car. Altman, a long-time Studebaker dealer, will be remembered by some as running a mail-order outlet for Studebaker parts and accessories. About 1000 cars per year will be produced. The pronounced rake of the original is eliminated so that the rocker panel is parallel to the ground, and wheel openings are tightened around the wheels. Interior fabrics will be made to customers' specifications, a touch possible because the Avanti II will be hand-built. The most important mechanical change is the Chevrolet engine, a 327-cu-in./300-bhp version. 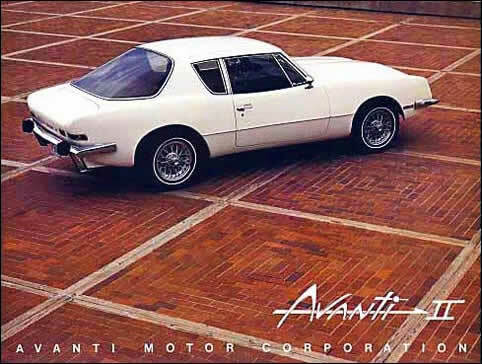 Avanti Motor Corporation Avanti II promotional brochure. Avanti II logo on the front. Difference between Avanti I and II. Avanti II logo on the rear. The "RQA" serial numbers appeared on the first Avanti II models from 1965 and continued into 1970. The "RQB" designation was added in 1970 and "RQA" was discontinued later that year. "RQB" was continued through 1985 though the Avanti II designation ended in 1984. The serial number and month/year of manufacture, along with a statement that all regulations at time of manufacture had been met, is found on a foil sticker or metal plate located near the door latch on the driver side of the B pillar. In addition to the "RQB" number, 16 digit VIN numbers may also appear on 1983-1985 models.